This weekend I took a trip back in time to go and watch the Gladiator Games. I haven’t done anything out of the ordinary for a while and so when I found out I had the chance to visit Guildhall Yard for some gladiator goodness I jumped at it. I wasn’t expecting too much from the hour long event but I have say, the organisers outdid themselves. 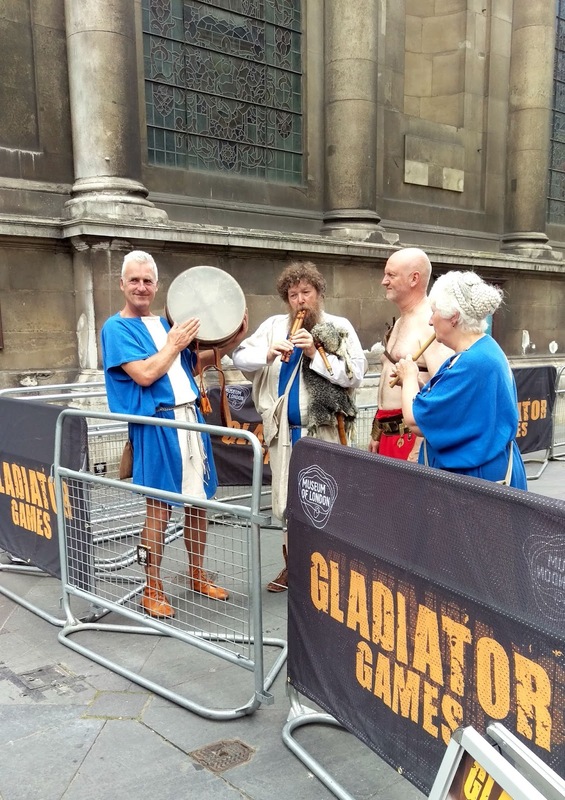 I was even more surprised to later find out that the Gladiator Games are performed by Britannia, the largest re-enactment group in the country, renowned for its work on one of my favourite films – Ridley Scott’s ‘Gladiator’. Despite that games being just a re-enactment, it turned out to be so much more. For one, it was so easy to get into it the atmosphere of it all. There were amazing actors in stunning costumes wondering around in character before the show, live acoustic music and even the smell of burning incense. The audience even got involved with foot stomping and clapping to Queen’s ‘We will rock you’ to add to the excitement. The show kicked off with an introduction of the fighters and the grand entrance of the little Emperor. The fact that he arrived on a horse drawn chariot just added to what made the show so brilliant. Britannia got the mix of humour and facts just perfect in order to keep the audience engaged throughout. 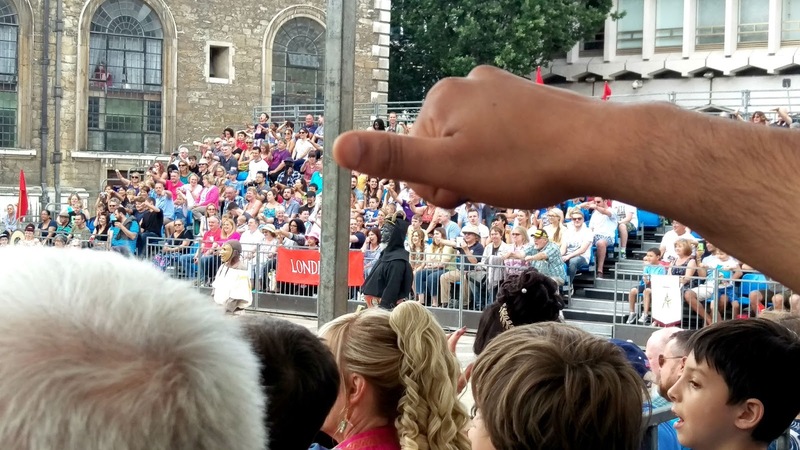 Before the show starts, the audience are taught the hand gestures for allowing gladiators lives to be spared or killed and what to shout out. A thumb out pointing left (or right) to kill and a wave to save them. It turns out I’m not very merciful at all and a lot of gladiators would be put to their death if it was down to me! Oops! 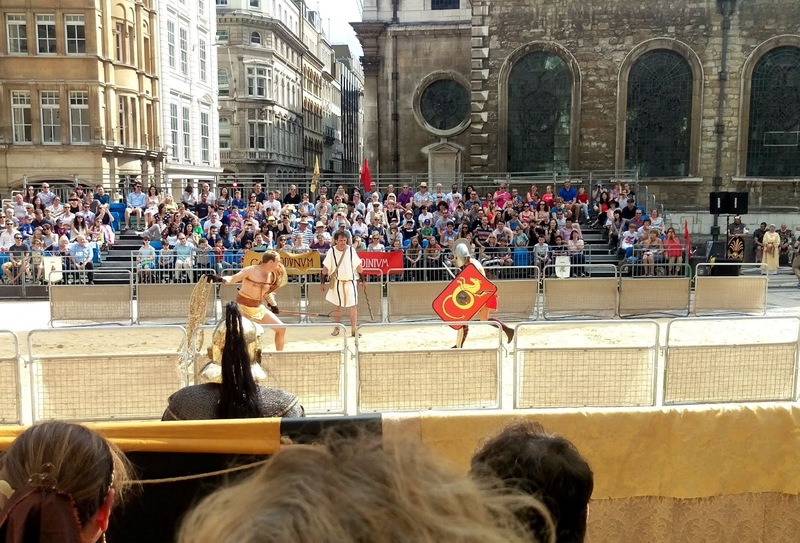 Once the fighting is all over, you are encouraged to go down under the courtyard, to the Guildhall Art Gallery where the remains of London’s actual Roman amphitheatre can be seen. Something about knowing that you’re on the actual grounds where something similar (just more gruesome) took place makes it all that much more exciting. If you look carefully whilst making your way to your seats, London’s architects have marked out an oval in darker stones – these mark the size of the Roman amphitheatre. The organisers of these modern games have made it so the event fits neatly inside that same earlier enclosure. 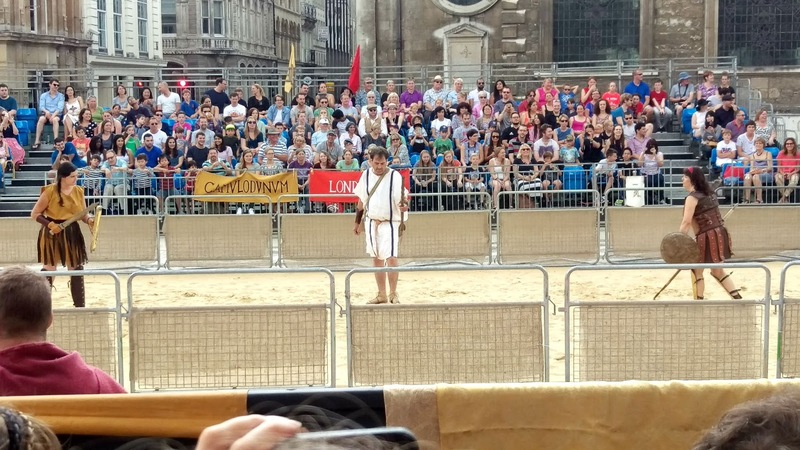 The gladiator games runs until the 16th August, and there are even some evening performances. It was a brilliant watch, definitely something a little different and a great way to enjoy the sunshine and maybe learn a little fact or two. Fun for all the family, a hearty recommendation from me.